Already a seasoned oil painter? Share your oil painting techniques here. 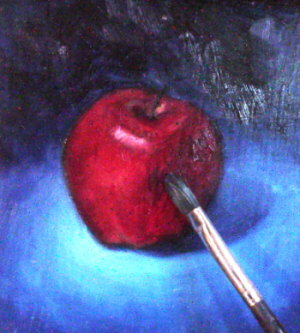 Oil painting techniques often intimidate many beginners and they end up thinking that oil painting is difficult. But really, oil is very forgiving and lends itself to many interesting effects. Oil paints were invented around the 15th century. Traditional, fine art oil paints are made by combining pigments with linseed oil (extracted from flax seeds). Oil paints quickly replaced egg tempera as the most popular artistic medium in Europe, and this popularity continues today. Its versatility, wide range of available colors, and the brilliance of the colors (compared to egg tempera) are some of the reasons for its appeal. I love the buttery consistency of oil paints. Because it dries slowly, I can take my time, correct mistakes, and plan my next step before I move on. Familiarize yourself with them so you can combine them to suit your needs. A Bit of oil painting history: old master technique. An explanation of the two main oil painting techniques: the Flemish and Venetian schools. You really can't get away from the tonal studies before you jump right into oil painting. Immediate and intense: my personal favorite technique. Learn these two techniques to use for special effects. A demo of these techniques using an oil sketch of William Bouguereau's angel. How quick oil studies can sharpen your oil painting techniques. I learned to paint alla prima fashion confidently through this simple and yet powerful practice. You can learn how to do it too. How do you paint roses? A step by step demo of showing you how to paint this beautiful subject matter. 7 simple steps to a landscape oil sketch from a photograph reference. Learn the order of painting a landscape both for an oil sketch and a finished painting. Learn how Claude Monet creates his painting. Discover the impressionist approach to blending oil colors. Choose the right oil brushes for your painting. Start in the right direction and spare yourself from the agony later. Here is a safe alternative which feels and paints like traditional oil paints so you can maintain the quality of your painting without compromising your health. Concerned about the toxicity of mineral solvents? Learn to make your own thinning agent. Can't find the medium you like from the art supply stores? Make your own and it's simple to do. Put together a customized at-home workshop with a master artist! It does not have to cost a lot to learn how to paint by yourself.